For those who haven’t heard of Swedish Hasbeens, let me introduce you to a pair of wooden-clad ‘70s-inspired clogs exported out of Stockholm. For those who have heard of Swedish Hasbeens, you’re probably not reading this anymore because you already clicked through to their big, wonderful, extensive sale on 6PM and their outlet store. Holy mother of minimalism, The Dwell Store is having a warehouse sale. Once the hyperventilating subsides, do wander over to luxuriate in their clever and austere offerings. L’Inde Le Palais is a teeny tiny boutique in Bologna, Italy that—by the grace of God—is having a colossal sale. A Junya Watanable printed top that retails for $576 is reduced to $174. A $649 Moschino PVC cape is offered for $195. An Amen wrap dress that regularly fetches $423 can be snagged for $127. 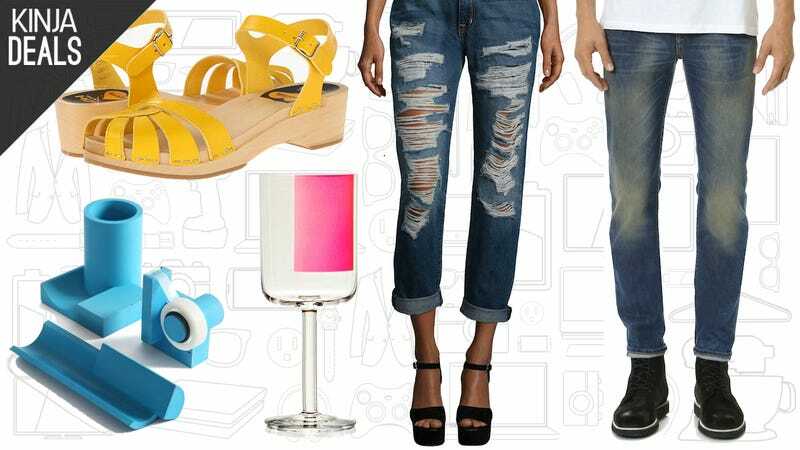 There’s only one catch: Most of these items only come in single sizes, so you’ll have to scavenge around a bit. Sanders Dress ($50) | Need Supply Co. There are some superb deals to be had on good ol’ American-made denim, which means that it’s the perfect time to wean yourself off $15 jeggings from Forever21. These babies are ethically made, maintain shape, and are far less likely to dye your legs blue. Breslin High Waist Flare ($63) | Need Supply Co. Although Zara and Vera Wang offer tempting deals on classic silhouettes, outerwear bargains have seen better days. Until the Black Friday bacchanalia begins, starry-eyed shoppers awaiting a dream coat should just hold tight. To christen our brand spankin’ new fella coverage, we’ve assembled the crème de la crème of menswear labels—Wrangler! Herschel! Patagonia! Levi’s! Hunter! and Carhartt!—for your enjoyment. So, go on, enjoy.